George Choundas, The Making Sense of Things, FC2, 2018. A grand tour of the edges of our lives, where glory and significance riot against the logic of living and the pall of tragedy. 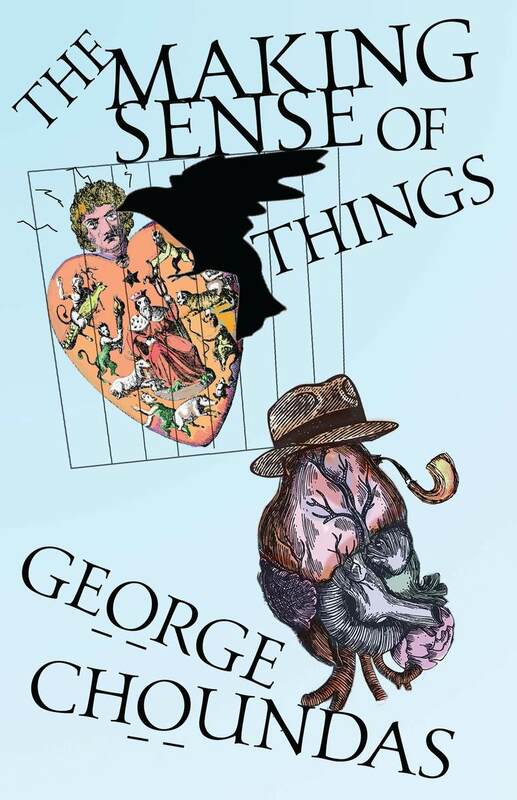 The Making Sense of Things is a collection of twelve stories that pulse with memory, magic, and myth—all our favorite ways of trying to make sense of things. Readers are treated to vivid and unforgettable characters. A fiercely independent woman puts the man who loves her to unconscionable tests, never guessing that arson, suicide, and canine obesity will yield a magical kind of happiness. A honeymooner in Venice, addled by fever and second thoughts, commits by dumb error a double murder. A brisk lawyer founders when a car wreck claims his son and ex-wife, then discovers that the desperation of grief is a kind of hope. Read a story from The Making Sense of Things, "How Hector Vanquished the Greeks", at Harvard Review Online. "The Wonder of Light Rail" in Punchnel's. "The Old Hok Wisdom" in the Kenyon Review. And two essays: "Dead Now" in Boulevard, and "My Muse Is Gaffay" in Passages North's "Writers on Writing." The royals of Sastrán announce aloud not only what they want at any given moment, but also what they don’t want. “I will not wear a scratchy cloak against my back. Or my neck.” “I cannot own a painting concerned with regret.” “I do not pine to attend a wedding where the officiant resembles too closely the groom.” They like to proclaim a non-desire out of thin air, elaborating on it apropos of nothing. They mention it regardless of the subject at hand, and notwithstanding the lack of apparent reason to speak or think of it at all. This confirms for everybody in earshot, and for themselves, their weight in the world. Clearly: if the slightest, strayest notion that feathers the backs of their skulls has a significance worthy of utterance, then their real concerns must move the very planet. George Choundas has fiction and nonfiction in over forty-five publications including Southern Review, Harvard Review, Alaska Quarterly Review, Michigan Quarterly Review, and Subtropics. His stories have been selected for inclusion in The Best Small Fictions 2015 and nominated for a Pushcart Prize. He is winner of the New Millennium Award for Fiction, a former FBI agent, and half Greek/half Cuban. His interests include films with scarabs.